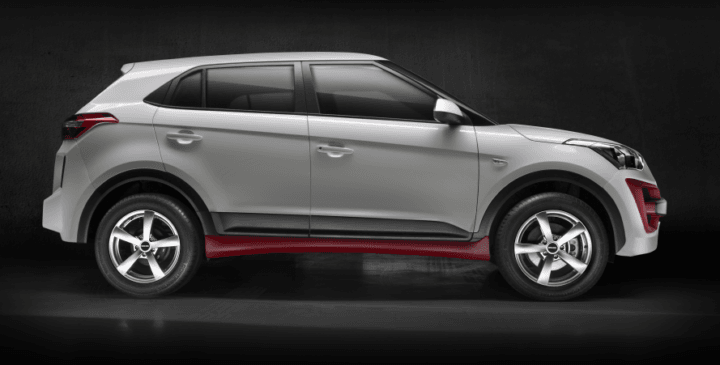 DC Design Gives Hyundai Creta a Makeover! One of India’s biggest car customising studios has decided to have a go at the Hyundai Creta. This modified Hyundai Creta by DC Design features changes to the exteriors and interiors. Changes are purely cosmetic as no changes have been made to the powertrain. Also, the overall cost of the modifications has not be revealed. Here’s a closer look at the Custom Hyundai Creta by DC Design. The Hyundai Creta by DC Design features a new front bumper and a new grille. Large black inserts with red highlights dominate the front bumper. The grille is also finished in red. Headlamps remain the same. DC seems to have chosen the base model Creta to carry out the modifications. Which means its does not get projector headlamps or LED DRLs. However, it is possible that DC will let customers chose from multiple aftermarket headlamp designs to go with the with the overall mod job. 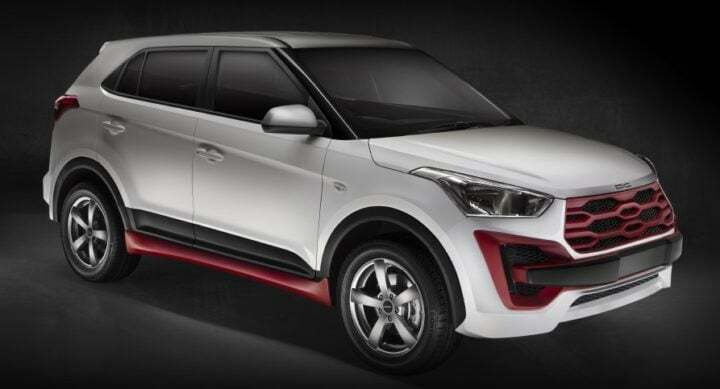 The modified Creta also features red side skirts, 5 spoke alloys and a new rear bumper. Changes to the interiors aren’t as extensive as the exteriors. In fact, based on the single image available, the only addition here is that of red upholstery and wood trim for the dashboard. DC Design seems to have overdone it with the usage of red. Everything from the seats, to the cup holders to most of the trim lower down is finished in red. As we mentioned earlier, DC seems to have opted for a base variant Creta to carry out these modifications. It does not get an audio unit or a touchscreen and misses out on auto aircon. Also, there are no steering mounted controls on offer. Stay tuned for more stories like the Modified Hyundai Creta by DC Design that we have here. Follow Car Blog India for the latest news and review from the Indian automotive world.